First, I want to thank everyone who is following! I also want to thank you for all the amazing things you have said to me. I have seriously contemplated giving up on this blog. Just when I'm at my lowest point, about throw in the towel, you guys say something that keeps me moving. Thank you, thank you, thank you!! (Enough of the blither-blather, get on with the giveaway winners!) Okay, okay I'll get on with it. V. At the half baked music snob! Wahoo! If the winners could e-mail me at jenniefire [at] yahoo [dot] com then we can work out all the details. 3. Link up whatever post you think is best, from whenever you want. 4. Go to the other links, socialize and follow! 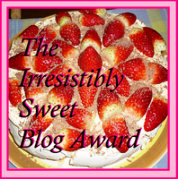 One last thing, I got another blog award! The very lovely and kind Lyn Midnight over at The Burning of Innocence saw fit to bestow me this award. Thank you so much! If you haven't checked out her blog, you should. She is has an incredible story going on over there that you will defiantly want to read! 1. If it didn't seem so monotonous, every single one of these things would be about food. I love food. Which means I should probably be at the gym rather than sitting in a computer chair. 2. I stared dance when I was three. I quit when I was ten, but then I picked it back up in high school. Now, I just dance around the house like a crazy person. My kids love it! Seriously, they really do love it. 3. My first date with my husband was on Valentines day. He asked me out a month and a half earlier, but circumstance made me unable to go. And, it wasn't the right timing. I didn't like him like that at the time. Anyway, when we finally went out, our date was seven hours long. Best first date EVER! The blog of S.J. Wist - Good book reviews and beautiful artwork! Joshua J Perkey's blog - great read for those of us who are aspiring authors! So head on over and check them out. Happy Monday all! This is my first blog award ever--I am so happy! Thank you so much! I love the idea of the "Monday Best". It's new to me. Any suggestions on what to enter? Congrats on the award. You so deserve it! Thanks for hosting a Monday blog hop. I'll be back later! I ran out to the grocer across the street an hour ago (oh yea, eazymode grocery shopping--be jealous lol) and raided their dessert section and--no lie--found a cake to match. It's a perfectly sweet day. ^ ^ ty so much again! Im off to go nom nom on this before my kiddies' sugar radar finds me lol. For some reason It won't let me post as me. So first let me say, This is Jen. Hi! That has to be the coolest thing ever! I think I need to go to the store now.